As I sit on the garden in front of my room on the first floor of the place I am staying at, I can see the moon having risen above the cover of palm trees on the protruding landmass in the lake right across my hotel. The water glistening like quicksilver between the landmass and where I am sitting at, I can’t quite tell if it is a full moon or a day away from it. I set my eyes on the ebb and flow of the silver, which in a way diverts my attention from, what I can say is, my first view of a silhouette created by moon light. The dense palm cover hides in its bosom the crass city lights that beam above and behind it. I can see a haze, highlighted by the city lights above the outline of the trees. In a way I am glad that the palm cover is close enough to save me from the glare, and yet far enough to create the pool of silver that I am transfixed at. I look heavenwards, my eyes adjust and I see the Orion close to the moon and slowly yet steadily, very dimly lit stars make their appearances as if someone far away knows that I am watching them. The light of the stars that I now see have traveled millions, if not billions of light years to be where I am at. Isn’t that a cosmic conundrum worthy enough to be pondered over, that all my choices since I was born, have led me to that solitary seat in a city, that I have now come to love for its quiet and an old world charm that only the likes of Kolkata can beat. Perhaps communism is good for nature? I don’t know, I am just asking? Yet again, I stare into the water in front of me, the gentle breeze and the calm around and my mind is trudging a thin line that separates reminiscing from nostalgia. Does this water have a hypnotic effect? Oh absolutely! I listen intently, and I hear the gentle breeze that caresses the surface of the water. I am lost, but can I really appreciate the beauty of that moment right there, if “I” still exist? Should not that “I” abdicate its throne to let the moment in? Can a vessel already full, take more water without spilling over? Is our mind not similar in a way, full with the prejudices, biases, likes, dislikes, ambitions, despair etc.? What happens when my mind full of such gross things looks at something so beautiful and peaceful? Is there a spill over, or I am just replacing one grossness with another? Even in calling what I see, as beautiful, am I not judging it thereby repeating myself all over again? Can an experience, a pleasant one such as this, be truly described in its absolute form? I don’t know? Perhaps questions for a different night I conclude. The calm of the entire experience has permeated my mind for now, I am thoughtless and yet aware as if waves in the sea had taken a break for a while? Suddenly, I see torch lights moving in the water, it is the local fishermen. The commercial activity in the water in the morning is bad for them as the fish tend to migrate towards non polluted areas of the backwaters only to return in the black of the night where these masters of catching fishes wait stealthily to make their days living. Ironic, eh? I find this funny because is there really an escape for those fishes constantly on the move to find their safe haven? And isn’t this something that applies to us as well? The boats wave up and down with the water, waiting relentlessly to net their efforts worth. I wish I can go and sit in one of their boats, listen in on their conversations but the law of the land prohibits any tourist boat activity post 6.00 p.m. There goes my wish to lay on a boat, drifting on the water, watching the stars twinkle and the cosmos go about its business. 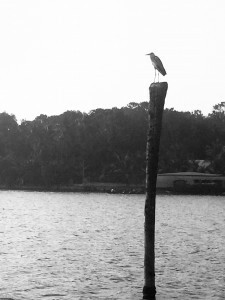 The lake that I am looking at is Ashtamudi, the one with eight arms. However commercial activity has severed one of its arms. Perhaps in a couple hundred years, when people have let go of their perception of this lake, the one of its yesteryears, it would be renamed Saptamudi, the one with seven arms. I look at my watch, it is way past bedtime, and I realize it is time to turn my back to this miracle of a scene. I turn my back to it and everything ceases to exist, is it true that I think therefore I exist? If ever you get a chance to visit Kerala, this is the place that must appear on your places to visit list. 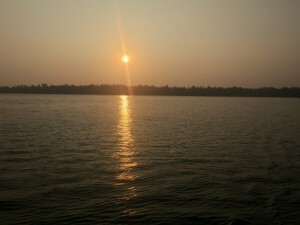 The Ashtamudi is in Kollam which is about 65 kilometers from Trivandrum, or about a 2 hour drive. If you want to unwind and reflect there is no better place than this gem of a waterbody, it’s surrounding adapting to the modern world from their malgudisque days and yet trying to retain the core of their being. I feel hopeful, I think it will prevail. 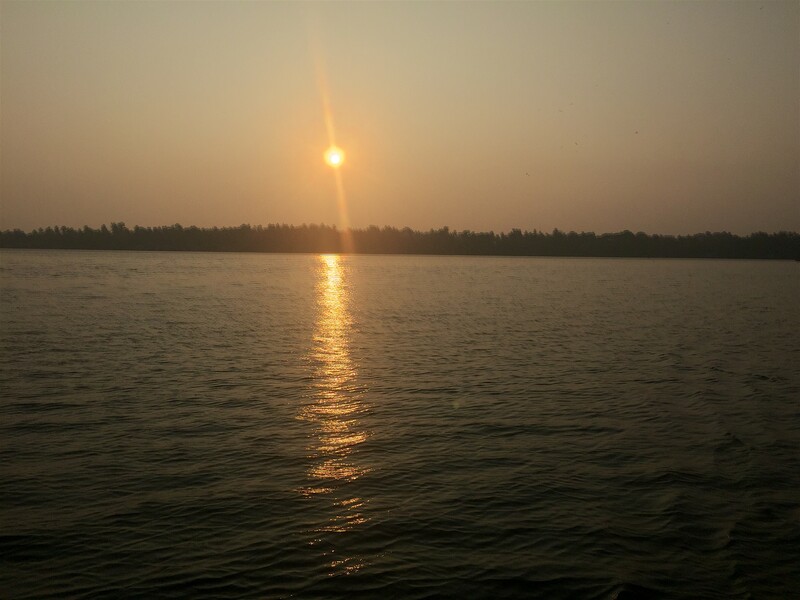 Ashtamudi Lake is considered to be the one of the most beautiful destinations of Kerala with combination of Blue and green all around. It gives soo many reasons to come back. 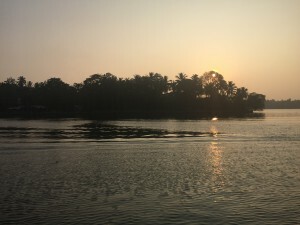 Ashtamudi lake is a very beautiful having unique wetland environs along with various lakes and backwaters mingled with tranquility and nature. Ashtamudi Lake is the most attractive tourist destination in Kerala with blue & green all around the Lake. thanks for sharing the article about this beautiful Lake.